As the lead singer, guitarist, and songwriter for Trampled by Turtles, Dave Simonett had a noteworthy 2016 full of sold out shows coast to coast -- including noteworthy performances at Newport Folk Festival and Red Rocks Amphitheater. The Midwest is to The Pines what Monument Valley was to filmmaker John Ford. The flat, endless expanses of the band's native Iowa are at once the settings of, characters in, and muse behind the songs on their new album, Above The Prairie. Songwriters David Huckfelt and Benson Ramsey—who along with Benson's brother Alex form the band's touring trio format—craft their music with a filmmaker's keen eye for detail and framing, blending celestial, ethereal atmospherics with rich, warm vocals and earthy acoustic instruments. It's a gripping brew that demands your total presence, transporting you into vividly painted musical and lyrical snapshots. "Almost all of the songs on the album are somewhere between the first and third take," says Huckfelt. "It was a matter of capturing raw performances and preserving that spirit, of not losing the energy of the songs in the recording of them." "It's kind of a risky way to work," adds Ramsey, "but we went back to Iowa and just did it in three days and that was pretty much it. It's almost like a photograph." Much like the photograph on the album's cover—which depicts a stunning nighttime landscape of wide-open grassland spotted with crumbling, abandoned cabins beneath an infinitely expansive galaxy of stars—the songs on Above The Prairie at once evoke the vastness of space, the ceaseless passage of time, the beauty of Earth, and the inescapable loneliness of inhabiting it. 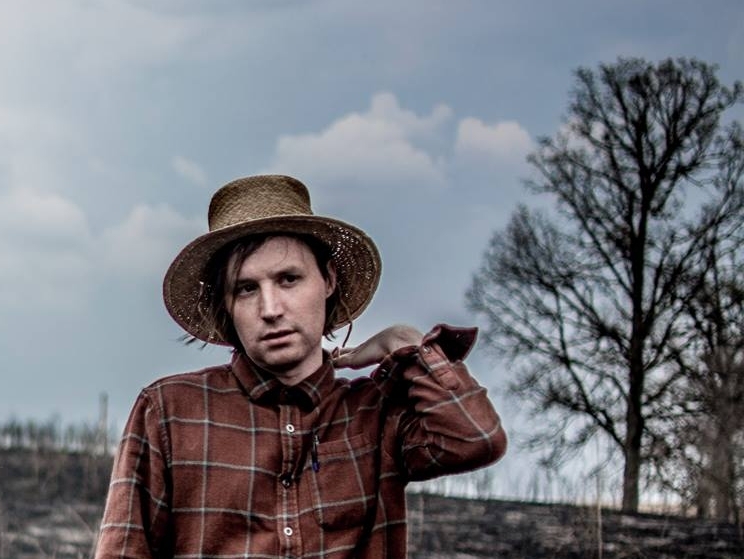 In some ways, Above The Prairie may sound like an attempt to reconnect with the past, to capture the feel of the land and the communities of their youths, but the songs seem rather to reflect on the impossibility of such an endeavor in the modern age. "People say you can't step in the same river twice," says Huckfelt, "but you can't even step in the same river once, because change is the only constant. Home isn't the same home you remember, and you don't get a minute to catch your breath to think about it." It's a sentiment that pervades the album and comes vividly to life on the record's closing track, "Time Dreams," a poem written and read by the famed Native American activist/poet John Trudell and set to music by The Pines. "He articulates some profound truths that resonate throughout the record," says Ramsey. "There's just this kind of disconnection from the Earth that we experience. There's this loneliness about it, and there's this truth that's sort of undeniable but that no one really wants to talk about." "We both grew up in Iowa in very sparse, rural communities," adds Huckfelt, "and we watched our towns kind of dissipate and the vitality go away, but at the same time also remain in certain hidden, unexpected ways." Above The Prairie explores those hidden places, from "Lost Nation"—a synth-driven instrumental penned by Alex and named after an Iowa town with a population of less than 500—to "Villisca," another soundscape featuring Uilleann pipes and titled for an Iowa community that lives under the ominous cloud of an infamous 1912 axe murder. "There's a remoteness to the record and the feelings," says Huckfelt. "These communities are tiny, but they're out there. There are homes with people and lives being lived there, and the towns we grew up in were not so different." Finding somewhere to feel at home is a recurring theme on the record. On "Where Something Wild Still Grows," Huckfelt longs for a place "through the trees, past the city, beyond the glow" where he can be at ease, while "Sleepy Hollow" finds Ramsey contemplating our treatment of each other and our planet as he looks into the abyss of the night sky, and "Come What Is" (which features Ryan Young of Trampled By Turtles on fiddle) tries to find contentment in the present moment. At the core of it all, though, is the realization that if this life is nothing more than a fleeting journey on a tiny speck of a planet floating among the stars of an infinite universe, then there's no more important act than to love each other and the Earth. When Ramsey sings "hold, hold on to me" in opener "Aerial Ocean"—which brings together lush, sweeping slide guitar with gently plucked guitar and banjo—it's repeated in the intimate, reverent tone of a prayer. The narrator might be singing to a person, or he might be singing to the prairie. In the case of The Pines, he's probably singing to them both.